Train Lodge Amsterdam i Amsterdam, Nederland: Bestill nå! Train Lodge is a perfect place for groups. All bookings larger than 9 persons are considered group bookings. Bookings for more than 9 people that are not confirmed by us by email can be cancelled without notification (see cancellation policy above). Cancellation procedures for group bookings deviate from standard bookings as follows: 4 weeks prior to arrival and only per email to info@trainlodge.com. Your reservation is canceled after you have received our confirmation email. In case of cancellation group booking after 4 weeks prior to arrival or in case of a “No Show” no refund is possible. A first instalment of 25% of the full booking value (minus the 15% deposit paid to Hostelworld) must be paid to Train Lodge to confirm the reservation. The remaining will need to be paid at least 4 weeks before the group arrival date. We can ask a security deposit depending the size of the group. Just a few years ago the sleeping cars of the Train Lodge where the luxury cars of the night train Zurich - Rome. Night trains are diminishing but our sleeping cars are very comfortable even more if these are not running. 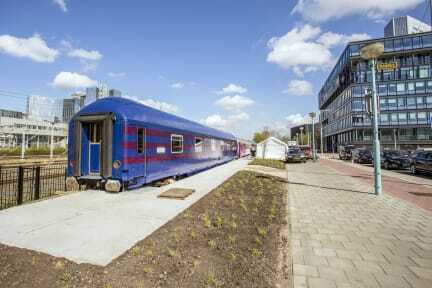 That is why we started a project for a hotel on a track in Amsterdam, one of most interesting and nicest cities. If you are looking to stay at a very nice spot in a comfortable accommodation at a affordable price, you should come to our Train Lodge. Meet other nice people, different languages, cultures and colours. Please stay with us, our Train Lodge with a retro atmosphere is a lovely place to stay where you sleep in the compartments of 4 comfortable former Swiss international sleeping train cars. 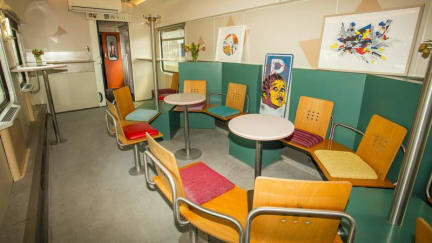 Together with a bistro train car and our sunny terrace you will like your stay. Our Train Lodge has a bar-bistro train car where you also check in. Our terrace is a nice place where you can meet you fellow travellers, have your drink, your breakfast or just stay around and meet new friends. You will find the Train Lodge next to the Amsterdam Sloterdijk Station where you find all connections by bus, tram, metro and train to all other hot spots in Amsterdam. But you can easily reach the important places, dance locations, festival, and so one. We have direct connection by train to the main airport of the Netherlands which is Amsterdam Airport Schiphol. Unique hostel in a train so don't expect the standard hotelroom. You will get the real train experience! Choose a bed in a shared or private compartment with 3 person bunk beds, or book it with your friends, schoolmates or club. You can even book a whole sleeping car to sleep up to 33 persons. In total we have 132 very affordable beds. Check in from 15:00 to 00.00 . The reception is open 24/7. From 23.00 till 07.00 the night porter/shift is available for check in or out. The bar is open from 7.00 till 01.00 (in the weekends till 03.00).